Any quantity only $25.99 per coin over spot! Austria and Hungary spent much of the 19th century and the first two decades of the 20th century connected in a dual monarchy. Known to Western nations as the Austro-Hungarian Empire, this collective monarch covered various nations and primarily used the Austrian Corona and other denominations as currency. The 1908 Gold Hungary 100 Korona Coin is currently available to you for online purchase at Silver.com. Ships to you within protective plastic! Restrike available from the Austrian Mint only in 1908! Available mintage is extremely limited! Consists of .9802 Troy ounces of actual gold content. Issued a face value of 100 Korona by the Austro-Hungarian Empire. The obverse side of the coin has a standing depiction of Franz Joseph I of Austria. On the reverse of the coin is the crowned arms of Hungary. Franz Joseph I was the longest-reigning Emperor of Austria and King of Hungary. He reigned from 1848 until his death in 1916 as the monarch of both nations in the dual monarchy of the Austro-Hungarian Empire. His effigy was commonly used on Austrian coinage but was typically depicted as a bust of his head alone. 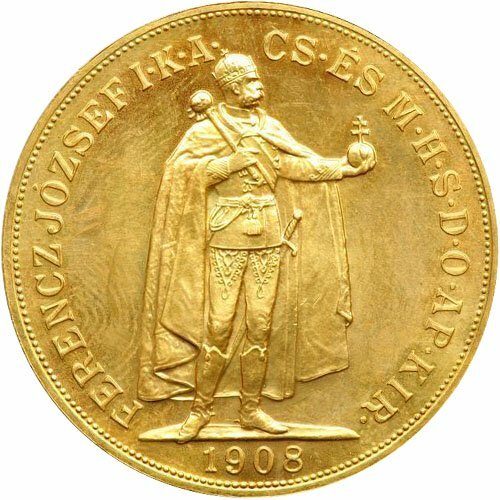 This unique 1908 Gold Hungary 100 Korona Coin from the Austrian Mint is a restrike issue available only with the 1908 date mark and has extremely limited mintage figures compared to other gold coins of its day, notably the 100 Corona Austrian coin. The designs on these 100 Korona Coins are unique. The obverse of the 1908 Gold Hungary 100 Korona Coin features the effigy of Franz Joseph I as a full-length figure standing with his left side visible. He wears a crown on his head and holds a scepter in his right hand, while his extended left hand holds a sphere. Engravings are available in Hungarian and identify Franz Joseph I as King of Hungary. 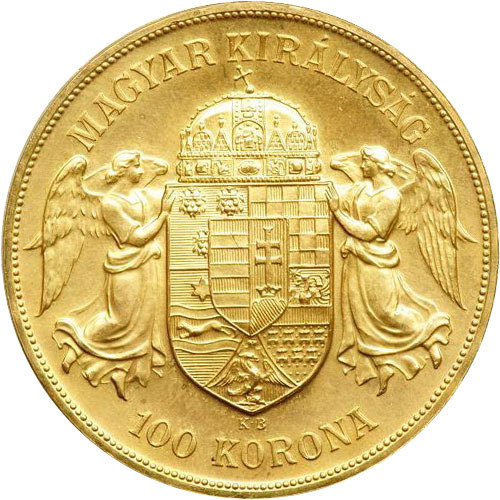 On the reverse of the Gold Hungary 100 Korona Coin is the coat of arms for the Kingdom of Hungary. The Kingdom of Hungary existed from 1000 until 1918 and was part of the Austro-Hungarian dual monarchy which officially existed from 1867 to 1918. The coat of arms has a crowned shield with two angels supporting it from either side. The Austrian Mint issued these restrikes of the 1908 Gold Hungary 100 Korona Coin and they are available to you today in AU condition. About uncirculated coins have slight signs of wear and tear on the surface areas. We encourage Silver.com customers to reach out to us with questions at 888-989-7223. You can also connect with us online through our live chat and email address features. Current gold prices are always available on our website as well!